NIVEA’s latest body care range promises visible fairness while protecting and repairing the skin cells. 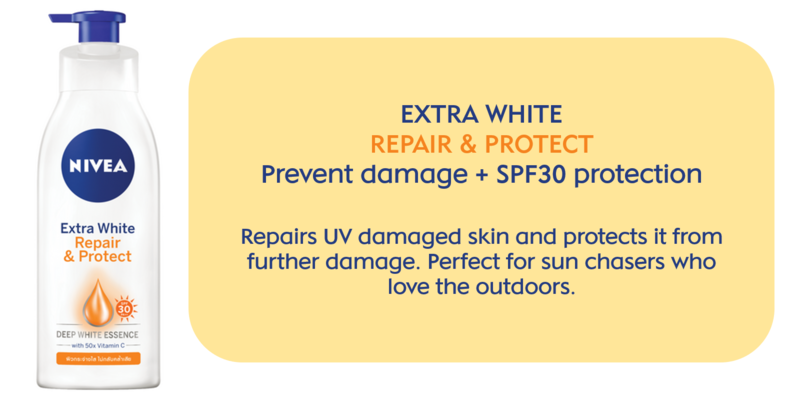 With NIVEA Extra White, pale, damaged skin is transformed into healthy and smooth skin that radiates and glows from within. Im using it, i really like the softness of my skin after using this product. I've used the product every after shower and what I like about it is that it's not sticky and helps lessen dryness of my skin. I've also seen my skin become fairer after days of applying it. Doesn't absorb as quickly as I'd like but it's not a big deal. That's really just my preference but overall, great product! Nice smelling, lightweight and easily absorbed by the skin. I have used this product for 1 week and I’ve noticed that my skin became softer and fairer. I suggest to apply this right away, after you take your morning shower/bath and/or before leaving the house so that you are already sun protected in case you forget to apply sunblock in your body. I will definitely continue using this product and this will occupy a permanent place in my shower stall! Nivea Extra White Repair and Protect has changed my life. It not only repairs my previously dry and flaky skin till it is now silky smooth, but with its SPF 30, it also protects my skin from the harsh UV rays I'm unknowingly exposed to daily. It absorbs quickly and is lightweight without any sticky feeling. Its Deep white essence and 50x Vitamin C really make it an absolute must in your daily routine!